Perfect HD video images are within your reach. 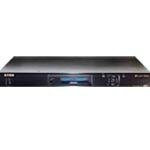 Video scalers and processors will improve images from low-resolution (standard definition cable, VCRs, laser disc players) and even 480p sources (such as upscaling DVD players). 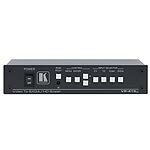 A video scaler or processor may also act as a switcher for your home entertainment system, standardizing all the sources you have to output HD video. Improved video quality is particularly valuable when your images are delivered in feet, not inches. If you want to know more about video scalers and processors, call a Projector Expert today. The Comprehensive VGA2HD01 VGA to HDMI 1080P Scaler Box is designed to upscale the analog video signal from a PC source to a digital HDMI output, up to 720p or 1080p. 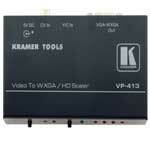 The Kramer VP-419xl is a high performance digital scaler for composite, s-Video and component (480i) video signals. It will scale a video input to a selectable graphics or HDTV output resolution. The VP-413 a high performance digital scalers for composite video and S-Video (Y/C) signals. It will scale a video signal to a selectable computer graphics video on a HD-15 connector. 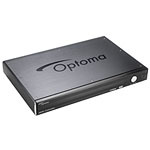 The Optoma HD3000 video processor converts all video sources to 1080p resolution. Includes 10-bit video processing for analog inputs up to 1080i. The HD-3000 is the definitive device to convert video sources to the optimum resolution.